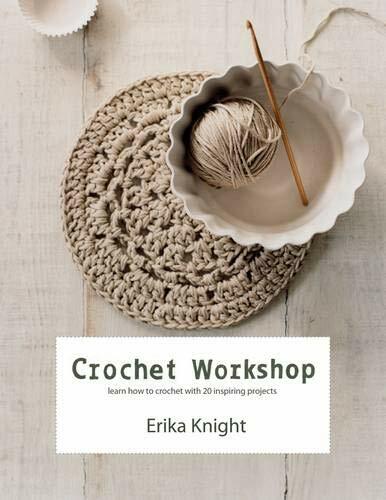 Crochet Workshop is the perfect book for the beginner. Under Erika Knight's guidance even those who have never picked up a crochet hook before will soon be making gorgeous projects and all the while learning new techniques and adding to their skills. Each of the 20 projects in the book will teach you a new stitch, technique or trick, and will build on and consolidate crochet techniques already learnt in the preceding projects, until you have mastered a wide repertoire of skills and completed an enviable collection of gorgeous crocheted items. With Erika's stunning designs, crochet is no longer the kitsch retro craft that saw the endless crocheted bikinis and shawls of the seventies. Crochet Workshop showcases the incredible variety of finishes that different crochet techniques can produce. Erika begins with simple scarves and hats that are chic accessories as well as being the perfect items to practice basic stitches. She then takes you through the dense textures of double and treble crochet - which make excellent bags, purses and even a laptop case - and then moves on to the more intricate, delicate lace stitches - perfect for heirloom shawls and antique-style cushions. Freeform or random crochet takes the craft to a more demanding level and projects like the edge-to-edge cardigan will provide a new challenge for all creative crocheters. With exquisite photography by Yuki Sugiura that perfectly shows each of the beautiful designs, and supported with clear charts and artworks, Erika Knight has created the ultimate book for new enthusiasts of this remarkable craft.